On November 1, 2016, following an investigation, members of the Hudson County Prosecutor’s Office Narcotics Task Force arrested two North Bergen residents for the possession and distribution of marijuana in North Bergen. 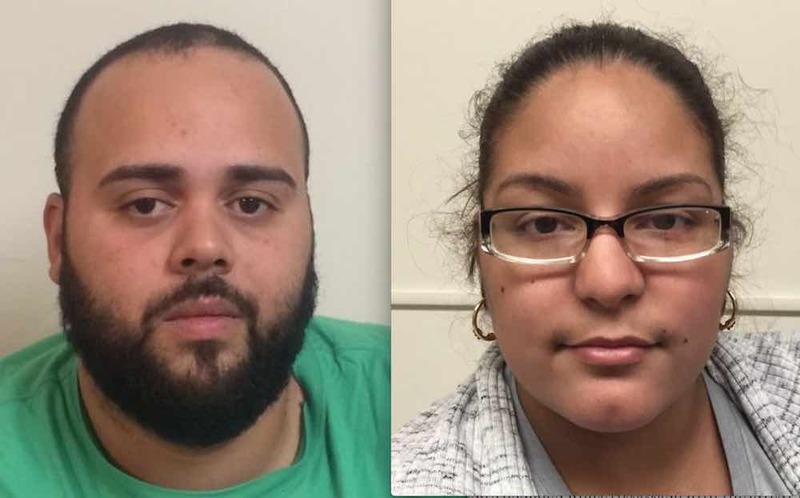 Task Force Officers arrested Anthony Gonzalez, age 30, and Jessica Oropeza, age 27, of 73rd Street in North Bergen on various charges involving the possession of marijuana with the intent to distribute. Gonzalez and Oropeza were arrested after a search of their residence led to the recovery of nearly 25 pounds of high-grade marijuana and a small amount of cocaine. The street value of the total quantity of marijuana seized is approximately $150,000. The Task Force also seized four handguns and over $140,000 in U.S. currency. Prosecutor Esther Suarez also credited the Hudson County Sheriff’s K-9 and Swat Units for assisting with the arrests. Bail for Gonzalez was set at $225,000 cash only. Bail for Oropeza was set at $150,000 cash or bond.  POSSESSION OF A CONTROLLED DANGEROUS SUBSTANCE (MARIJUANA) IN AN AMOUNT OF 5 POUNDS OR MORE BUT LESS THAN 25 POUNDS IN VIOLATION OF N.J.S. 2C:35-5.  POSSESSION OF A FIREARM DURING THE COURSE OF COMMITTING A VIOLATION OF N.J.S. 2C:35-5 BY POSSESSING A HANDGUN WHILE POSSESSING WITH THE INTENT TO DISTRIBUTE LESS THAN ONE HALF OUNCE OF COCAINE AND MORE THAN 5 POUNDS OR MORE BUT LESS THAN 25 POUNDS OF MARIJUANA IN VIOLATION OF N.J.S. 2C:39-4.1.  POSSESSION OF A FIREARM DURING THE COURSE OF COMMITTING A VIOLATION OF N.J.S. 2C:35-5 BY POSSESSING A HANDGUN WHILE POSSESSING WITH THE INTENT TO DISTRIBUTE LESS THAN ONE HALF OUNCE OF COCAINE AND MORE THAN 5 POUNDS OR MORE BUT LESS THAN 25 POUNDS IN VIOLATION OF N.J.S. 2C:39-4.1.  POSSESSION OF A DEFACED FIREARM SPECIFICALLY BY HAVING IN HIS POSSESSION A HANDGUN WITH A DEFACED SERIAL NUMBER IN VIOLATION OF N.J.S. 2C:39-3D.  DISTRIBUTION OF A CONTROLLED DANGEROUS SUBSTANCE (MARIJUANA) WHILE WITHIN 1,000 FEET OF SCHOOL IN VIOLATION OF N.J.S. 2C:35-7.  DISTRIBUTION OF A CONTROLLED DANGEROUS SUBSTANCE (MARIJUANA) WHILE WITHIN 500 FEET OF A PUBLIC PARK IN VIOLATION OF N.J.S. 2C:35- 7.1. DISTRIBUTION OF A CONTROLLED DANGEROUS SUBSTANCE (COCAINE) IN A QUANTITY LESS THAN 1/2 OUNCE, IN VIOLATION OF N.J.S. 2C:35-5.  ENDANGERING THE WELFARE OF A CHILD SPECIFICALLY BY MAINTAINING A DRUG DISTRIBUTION FACILITY IN THE SAME PREMESIS WHERE THE CHILD LIVES AND CREATING A SIGNIFICANT PROBABILITY THAT SAID CHILD WOULD BE NEGLECTED AND OR ABUSED BY NEGLECT; AND BY SPECIFICALLY KEEPING THE CHILD WITHIN REACH OF A CONTROLLED DANGEROUS SUBSTANCE (MARIJUANA), WITHIN THE REACH OF THE CHILD; AND BY MAINTAINING A LOADED FIREARM WITHIN REACH OF SAID CHILD IN THE PREMESIS IN VIOLATION OF N.J.S. 2C:24-4.  POSSESSION OF A FIREARM AFTER HAVING BEEN CONVICTED IN THE STATE OF NEW JERSEY FOR DISTRIBUTION OF A CONTROLLED DANGEROUS SUBSTANCE AND FOR A CONTROLLED DANGEROUS SUBSTANCE ON SCHOOL PROPERTY IN VIOLATION OF N.J.S. 2C:39-7.  POSSESSION OF PROPERTY KNOWN OR BELIEVED TO BE DERIVED FROM CRIMINAL ACTIVITY, SPECIFICALLY $140,306 IN UNITED STATES CURRENCY, FOUND INSIDE A DRUG DISTRIBUTION FACILITY IN VIOLATION OF N.J.S. 2C:21-25.  CONSPIRING WITH ANOTHER TO POSSESS PROPERTY KNOWN OR BELIEVED TO BE DERIVED FROM CRIMINAL ACTIVITY, SPECIFICALLY $140,306 IN UNITED STATES CURRENCY, FOUND INSIDE A DRUG DISTRIBUTION FACILITY IN VIOLATION OF N.J.S. 2C:21-25 AND CONTRARY TO THE PROVISIONS OF N.J.S. 2C:5-2.  PURPOSELY BOOBY TRAP A DRUG DISTRIBUTION FACILITY SPECIFICALLY BY MAINTAINING A LOADED FIREARM IN THE BEDROOM OF SAID PREMESIS WHERE DRUGS WERE ALSO STORED FOR DISTRIBUTION IN VIOLATION OF N.J.S. 2C:35-4.1.  MAINTAINING A FORTIFIED PREMESIS SPECIFICALLY BY HAVING TWO LARGE CANINES, SPECIFICALLY OF THE PIT BULL BREED, INSIDE A DRUG DISTRIBUTION FACILITY IN VIOLATION N.J.S. 2C:35-4.1. ENDANGERING THE WELFARE OF A SECOND CHILD SPECIFICALLY BY MAINTAINING A DRUG DISTRIBUTION FACILITY IN THE SAME PREMESIS WHERE THE CHILD LIVES AND CREATING A SIGNIFICANT PROBABILITY THAT SAID CHILD WOULD BE NEGLECTED AND OR ABUSED BY NEGLECT; AND BY SPECIFICALLY KEEPING THE CHILD WITHIN REACH OF A CONTROLLED DANGEROUS SUBSTANCE, (MARIJUANA) WITHIN THE REACH OF THE CHILD; AND BY MAINTAINING A LOADED FIREARM WITHIN REACH OF SAID CHILD IN THE PREMESIS IN VIOLATION OF N.J.S. 2C:24-4.  MAINTAINING A DRUG DISTRIBUTION FACILITY WHERE A CONTROLLED DANGEROUS SUBSTANCE (MARIJUANA) WAS LOCATED IN A QUANTITY OF OVER FIVE POUNDS IN VIOLATION OF N.J.S. 2C:35-4.  CONSPIRING WITH ANOTHER TO POSSESS WITH THE INTENT TO DISTRIBUTE A CONTROLLED DANGEROUS SUBSTANCE (MARIJUANA) IN A QUANTITY GREATER THAN FIVE POUNDS BUT LESS THAN TWENTY FIVE POUNDS IN VIOLATION OF 2C:35-5 AND CONTRARY TO THE PROVISIONS OF N.J.S. 2C:5-2.  POSSESSION OF DUM-DUM OR BODY ARMOR PENETRATING BULLETS IN VIOLATION OF N.J.S. 2C:39-3. POSSESSION OF A FIREARM DURING THE COURSE OF COMMITTING A VIOLATION OF N.J.S. 2C:35-5 BY POSSESSING A HANDGUN WHILE POSSESSING WITH THE INTENT TO DISTRIBUTE LESS THAN ONE HALF OUNCE OF COCAINE AND MORE THAN 5 POUNDS OR MORE BUT LESS THAN 25 POUNDS IN VIOLATION OF N.J.S. 2C:39-4.1.  POSSESSION OF A DEFACED FIREARM SPECIFICALLY BY HAVING IN HER POSSESSION A HANDGUN WITH A DEFACED SERIAL NUMBER IN VIOLATION OF N.J.S. 2C:39-3.  ENDANGERING THE WELFARE OF A SECOND CHILD SPECIFICALLY BY MAINTAINING A DRUG DISTRIBUTION FACILITY IN THE SAME PREMESIS WHERE THE CHILD LIVES AND CREATING A SIGNIFICANT PROBABILITY THAT SAID CHILD WOULD BE NEGLECTED AND OR ABUSED BY NEGLECT; AND BY SPECIFICALLY KEEPING THE CHILD WITHIN REACH OF A CONTROLLED DANGEROUS SUBSTANCE, (MARIJUANA) WITHIN THE REACH OF THE CHILD; AND BY MAINTAINING A LOADED FIREARM WITHIN REACH OF SAID CHILD IN THE PREMESIS IN VIOLATION OF N.J.S. 2C:24-4.